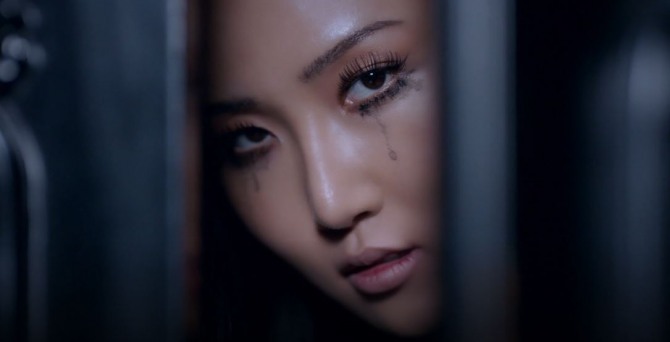 Hwasa of Mamamoo dropped a teaser for the music video of her solo track “Twit” on social media on Tuesday afternoon. The clip starts with Hwasa being covered in white veil-like clothes in front of a huge plaster figure in the shape of a hand. In each scene, she stands amid a phantasmal atmosphere that suits her unique dreamlike vocal tone and the tropical-like trap beat tune. In another scene, she wears a black swimming suit and is covered with clear wrapping paper. The 25-second clip finishes with the singer, with smudged makeup, singing “I am a twit” in Korean. Hwasa, who debuted with Mamamoo in 2014, will release her solo track at 6 p.m. Wednesday.